Midlands-based commercial property developer Barberry has unveiled plans for the £9.5 million speculative development of a 70,000 sq ft warehouse unit at the site of a former DIY store in Northamptonshire. Barberry has confirmed its acquisition of a 3.5-acre site at Sopwith Way, Daventry, for an undisclosed sum from New River Retail. It marks the latest in a growing portfolio of production/warehouse developments for Barberry, which has a 2018/19 pipeline of mid-box units at 16 individual buildings totaling 850,000 sq ft. 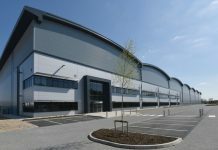 The developer recently completed units of 46,000 sq ft and 65,000 sq ft in Birmingham. both of which were promptly placed under offer before practical completion. In a joint venture with Richardson, Barberry has also started construction of the first phase of five mid-box industrial units, totaling 174,500 sq ft, in Bristol, and has been selected as the development partner to deliver a £140 million business park – with more than 1.75 million sq ft of accommodation – at Aycliffe Business Park in County Durham. The Daventry development will be on the prominent site of the former Focus DIY store, which has been vacant for several years, Barberry development director Jon Robinson confirmed. “I am pleased to announce that we have completed the acquisition of the former Focus DIY site in Sopwith Way, Daventry and are looking forward to delivering a high-quality warehouse in a prominent location fronting the A361 Drayton Way. The site is located next to the established Drayton Fields Industrial Estate, which has limited availability due to its popularity and we hope to provide additional accommodation to fit with occupational demand,” said Jon. Barberry aim to submit a planning application to Daventry District Council before the end of the year. If planning consent is forthcoming, the company plans to start construction in Q2 with practical completion anticipated in Q4 2019. The site is located in a prime location on the established industrial estate of Drayton Fields, just half a mile from the A45, leading to J18 of the M1 around 6.5 miles away. The new A45 Daventry Development Link Road will also providing improved access to J16 of the M1, completion estimated later this year. Other major occupiers near the site include Amazon, Tesco, Ford, Wincanton and Cummings.